Me = Poh? I often gave a confused look as a reply to these compliments. And very often, I was always double confirmed with this... " You really look like Poh when you smile." Being both Asians, Poh and I do have "disappearing" eyes when we display our super-wide smiles on our faces and I reckon this actually make most people having the impression that we look kind of similar... In fact, Poh is actually a pretty girl who has a cheerful personality and so why would I mind looking like her... LOL! Poh was born in Malaysia and had her first nine years living in Kuala Lumpur, Malaysia. Her family and her then migrated to South Australia and now, after gaining her fame at the Australian Masterchef, she is hosting her cook show called Poh's Kitchen at ABC channel. I'm thinking... If I look like Poh, maybe I can cook like her... LOL! 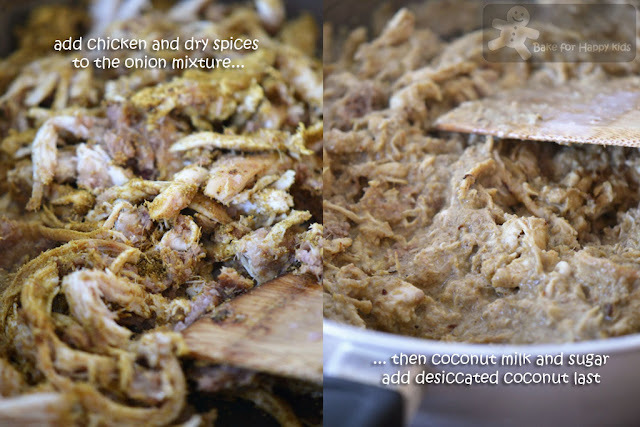 So, here I am cooking this Poh’s Aussie-Asian fusion style of Chicken Rendang, served with coconut pancakes. Poh cooked this dish when she was competing in MasterChef show and the recipe comes from the book, Masterchef Australia The Cookbook (volume one). In term of its taste, colour and texture, I wouldn't say that this is an authentic Rendang recipe and prefer to refer it as a fusion kind. It is quite fragrant for its taste but just ok for us in general. Based on the amount of coconut milk and coconut used in this chicken dish, I reckon this chicken dish can be quite filling to eat and this recipe can serve up to 6 instead of 4. Interestingly, it was a different story for the pancakes... As stated in the recipe, this amount can make up to 12 lace-like pancakes but I can only make 8 simple ones in total and the amount that I made were simply not enough to wrap and eat this full amount of chicken. I blamed myself for not being skillful enough to make the lace-like pancakes because they all broke when they were flipped... I don't think I'm quite "Poh" yet. LOL! In regardless of what shapes, sizes and patterns, these coconut pancakes were delicious and these 8 pancakes that I have cooked is just enough to serve the three of us. Now, you can see why we didn't eat much of the chicken rendang.. simply because we ate too much of these coconut pancakes. Ops! 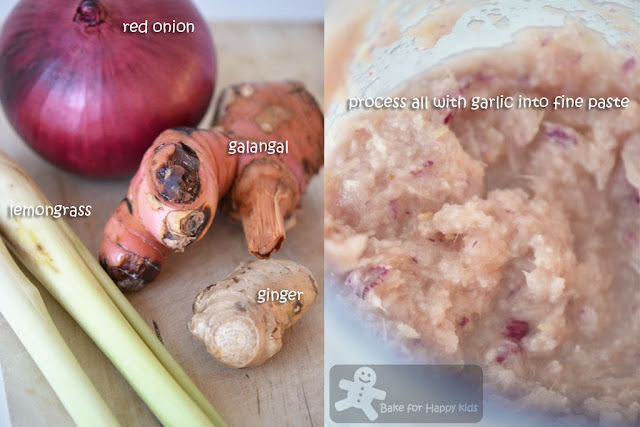 Place eshalots, garlic, ginger, galangal and lemongrass in a blender and process to form a fine paste. 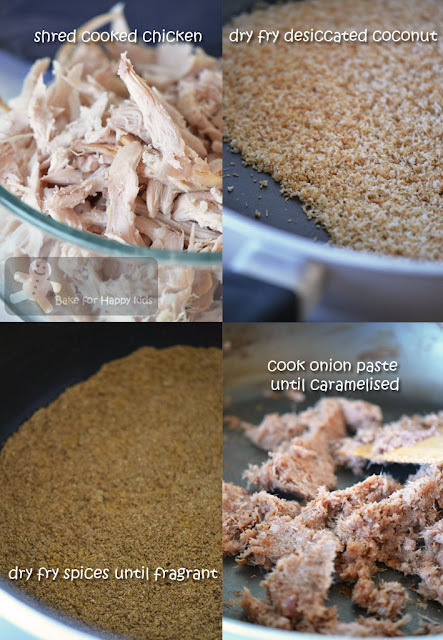 Heat oil in a frying pan and cook paste over medium heat until fragrant and caramelised. Add chicken, dry spice mixture, coconut milk and sugar to eschalot (onion) mixture. Cook until sauce has reduced slightly. Add toasted coconut. This will absorb most of the sauce. Keep cooking till mixture is quite dry and forms a golden crust on the underside, and keep tossing until all the chicken has a crispy, golden appearance. To make the pancakes, whisk flour, salt and eggs in a large jug until completely smooth. Add coconut milk to make the batter the consistency of pouring cream. Pass mixture through a sieve to give a very smooth texture. Heat a lightly oiled non-stick frying pan over medium heat. Make sure the pan is sufficiently hot before attempting a pancake. Pour batter into the empty milk carton, and in a tight zig zag motion pour a thin stream from one side of the pan to the other. Repeat the action at the right angles to form a crosshatch pattern. To complete, move in concentric circles around the outer edge of the crosshatching to knit the lattice together and make the pancake stable enough to pick up. Using a butter knife, flick up an edge and gently pick the pancake up with your fingers. Flip onto the other side and cook for 2 sec. Place the pancake on a plate. Repeat with remaining pancake batter to make 12 pancakes. I tried cooking these lace-like pancakes but failed because they all broke up into pieces when I flipped them and so I made my pancakes into simple round ones instead. 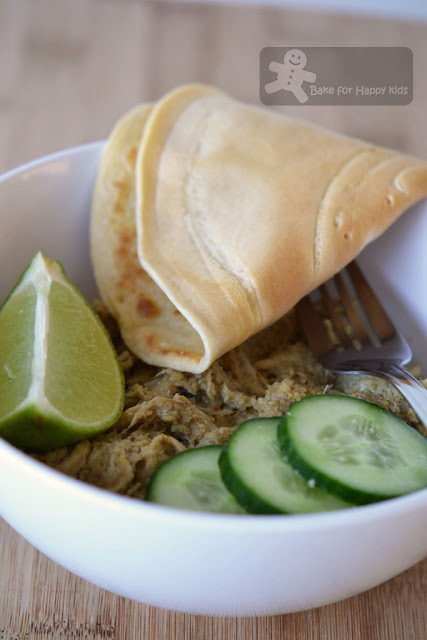 Serve the pancakes hot or at room temperature with the Chicken Rendang, freshly sliced cucumber and a wedge of lime. Chicken rendang and coconut pancakes, sounds so yummy! Btw Zoe, hope u dont mind me asking, but are u Malaysian too? And what a coincidence! I also used a recipe from MasterChef Season 1. Its interesting that it uses shreded cooked chicken. Would be really nice as a sandwich filling too. Now I have some idea how you look like. LOL! This looks delicious! 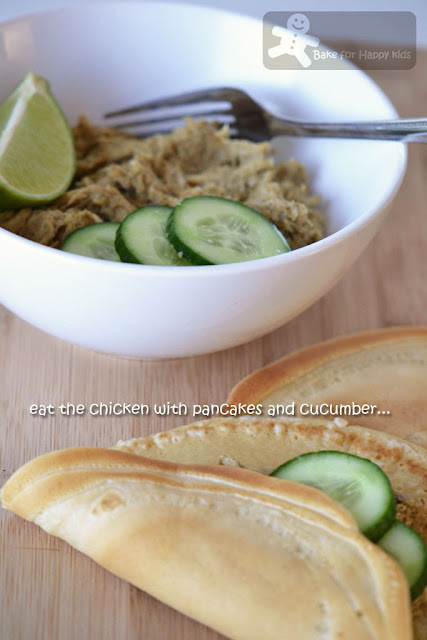 I would love to have chicken rendang with pancakes... a different way of eating rendang. Zoe, you are really "quick hand quick leg"(which means quick in action in cantonese)! 2 postings of Masterchef! Love the chicken rendang & the homemade coconut pancake! Oh, let's not forget that Poh is one of my all time favourite ex-contestant, hahaha! I love your step by step guide to making this delicious healthy snack . Wow this looks super gourmet and fresh! I love asian cuisine. Yes, Poh's chicken rendang is very much different from our traditional ones. Am however curious as to how it tastes! Looks good eaten with the pancakes! I like watching her shows though, and I was rather surprised to learn that she is an artist too! Rendang with pancakes? What a new and delicious combination! Whether you look like her or not, you certainly have captured the essence of what I consider to be a yummy looking Chicken Rendang and that's all that matters isn't it. And those Coconut Pancakes well, I'm in for those too!!! Nice to hear from you. And of course, I'm more than happy if you pinned my post to your chicken month board. There's a Thai cart at the farmer's market that makes delicious coconut pancakes. I've never been brave enough to try making them myself. This sounds wonderful. I especially like the sound of the coconut pancakes, I could see doing a lot with those. Nice recipe! So so glad you found my blog because I find yours! Definitly going to comme back here often:) Love this recipe! OOh this looks good! I adore Poh's eccentric style and m completely taken by her "lit-up-hundred-blubs" smile. Here in India, on Fox Travel Channel, they are now showing Poh's Kitchen and she is marvelous. 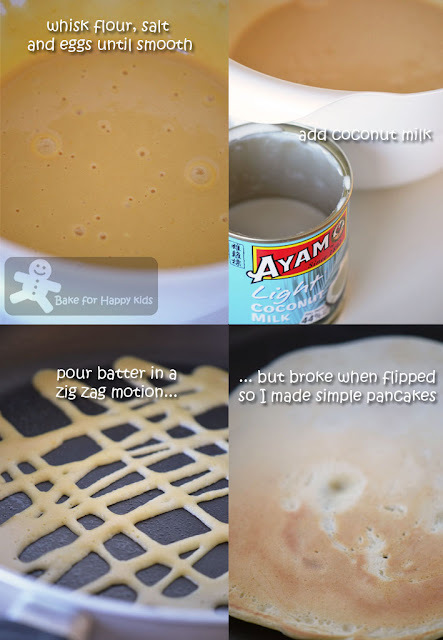 Would love to try out these delish coconut pancakes. Will go really well with a variety of curry dishes. both parts of the dish appeal to me, but i would have never thought of eating them together. i love how the rendang looks though! oh my gosh this sounds fabulous! the coconut pancake sounds like our malaysian roti jala. Very fresh idea eating rendang wrapped in a pancake and roti jala is nice with curry. Maybe her chicken rendang is more suitable to cater for the 'angmohs'. Oh my goodness those lace pancakes would have looked so awesome. I'm a novice when it comes to pancakes though, so I don't think I'd be able to do it either. The pancakes look amazing with the beef rendang anyways! Your Rendang Chicken and pancake do sounds very appetizing. Love the shredded chicken too. These chicken filled pancakes look fabulous...and delicious with coconut in the chicken...really tempting Zoe. hmmmm i want to try a rendang recipe and since i'm not asian maybe i'd love this fusiony type one! They actusally look pretty good as a pancake. It all sounds awesome. I have seen the net roti or lacy pancaker before...but I have never tried to make it! HI Zoe. I love how you're challenging yourself with all these recipes. I have a hard time cooking crepes (or pancakes) as well. They never flip perfectly and always stick to the pan. The chicken looks amazing though! I might have to save this recipe for a cool winter night. Love the idea of the pancakes! Such a nice looking dish, and it includes some ingredients with awesome flavors. Just the kind of thing I like to eat - thanks for this. One of the greatest thing about Asian contestants in Masterchef is that they bring out a lot of new ingredients and ideas to the public. Poh is one of my favourite cook and she is so creative to bring the Asian dish to the western table. Love this Sept special you're doing! Good job!